If you need an afternoon pick-me-up these are definitely the brownies for you! These were so incredible that I think I’m going to have to make a decaf version so I can have more of them! I’m so sensitive to caffeine that I could only handle a taste of these, but they are so decadent and delicious it was hard to stop at just a taste. 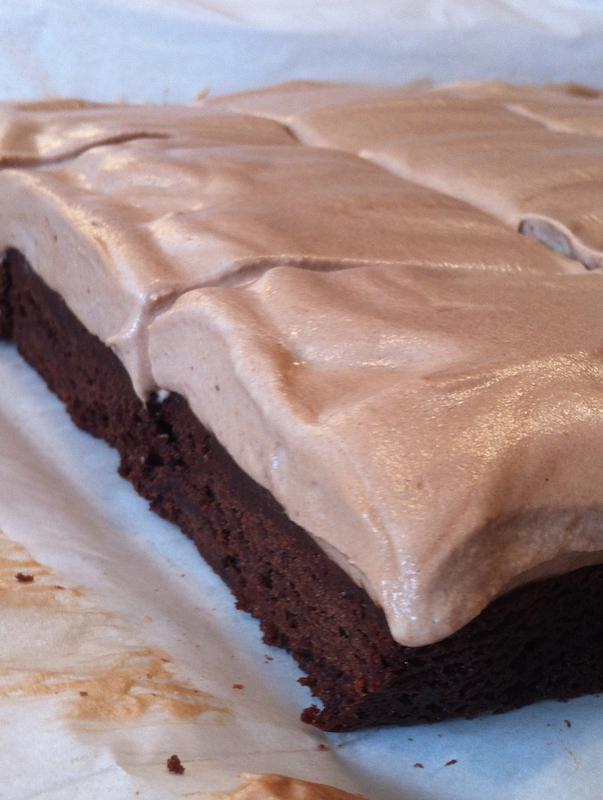 I’m a huge fan of coffee-flavored desserts, and these brownies pack a punch of coffee flavor! The dark chocolate pairs perfectly with the rich espresso and the Nutella espresso mousse is so good I’d eat it on its own any time. Together it’s like all your dreams come true. Fluffy, delicate mousse paired with rich, dense brownie…what more can you say. Preheat oven to 350°F. Lightly coat the bottom of a 9×13″ pan with cooking spray, line with parchment paper and lightly spray again. Set pan aside. In a large bowl, melt the butter. Whisk in the espresso powder until it’s completely dissolved. Whisk in the sugar. Add eggs one at a time, whisking well after each addition. Whisk in the vanilla. Then stir in the dry ingredients until just combined. Pour batter into the prepared pan and bake for about 20-25 minutes, or until a toothpick inserted into the center comes out with a few crumbs. Allow to cool completely. In a bowl, whisk together espresso and hot water. Whisk in the Nutella and vanilla until smooth. Using an electric mixer with a whisk attachment, whisk the heavy cream until stiff peaks form. Carefully fold in the Nutella mixture. Spread mousse into an even layer on top of the cooled brownies. Refrigerate for one hour or up to overnight. To serve, lift the brownies out of the pan using the parchment paper and cut, serve immediately. I think substituting instant coffee for espresso would be fine. I think I’d do that next time since I have some decaf instant coffee…all the deliciousness with less of stay-up-all-night caffeine.